New for 2011, the AL-KO Premium range offers high specification, feature packed machines with powerful engines. 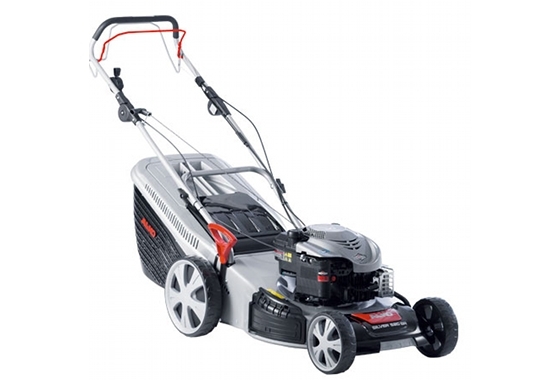 The 520BR Premium is a 51cm self propelled rotary mower.Powered by an easy starting and powerful Briggs & Stratton 650 Series engine, this model also benefits from the AL-KO 4INONE function – with collection, mulch, side and rear discharge capabilities all from one value for money machine.The 520BR Premium also features AL-KO Highwheels for improved traction, and adjustable handles to improve operator posture and comfort.On AL-KO Premium models, the ULTRAMOW steel deck features a conditional 5 year homeowner warranty, complete with an aesthetic and protective front design. Adjustable Handles: Easily adjust the handle bar to suit the operator’s height – two quick release clips allow a range of angles for optimal user comfort. AL-KO Highwheels: This model features large diameter wheels for improved traction and manoeuvrability. Ball bearings ensure smooth running for years of use.